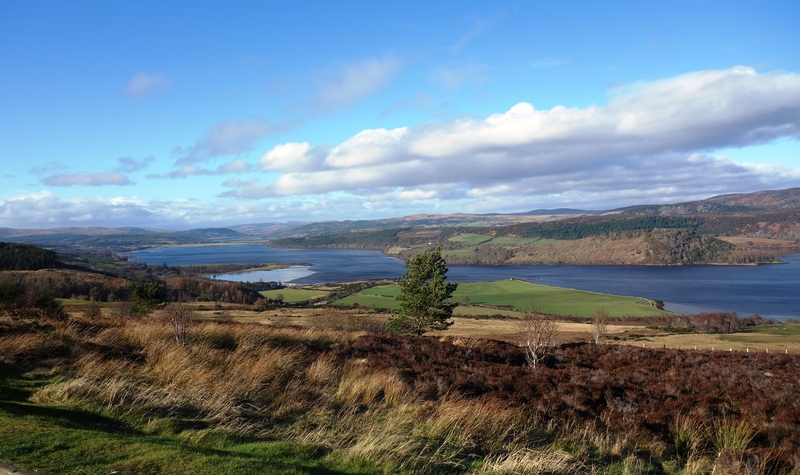 Bonny Scotland – Dornoch Firth, mouth of the salmon rivers Carron, Oykel, and Shin. Ghillie and his angler at the Black Bank Pool, River Naver. 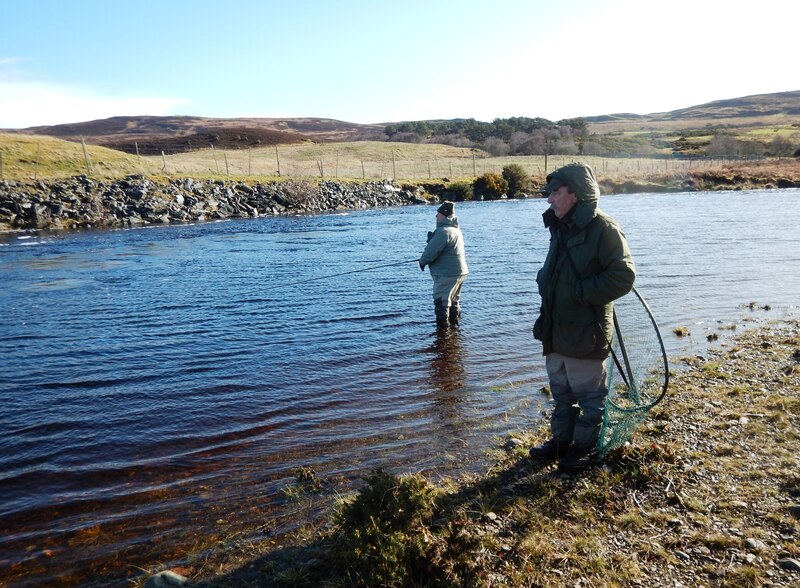 The 2019 Atlantic salmon season in Scotland – the best place in the world to catch early run fish – got out of the gate with a bright, springer salmon coming from a pool called Potato Park on the River Naver January 19th. It is known that some bright salmon enter rivers on Scotland’s north and east coast in every month of the year, but mid-January is early, even by their standards. No more were to follow until February, but when I arrived on March 3 there had already been nearly 20 taken with 6 for 12 rods in one recent week. When I finished fishing on the 16th I think the Naver’s count was approaching 30 – a very good number for this small river so early in the season. The nearby Thurso had also started to produce a few fish. 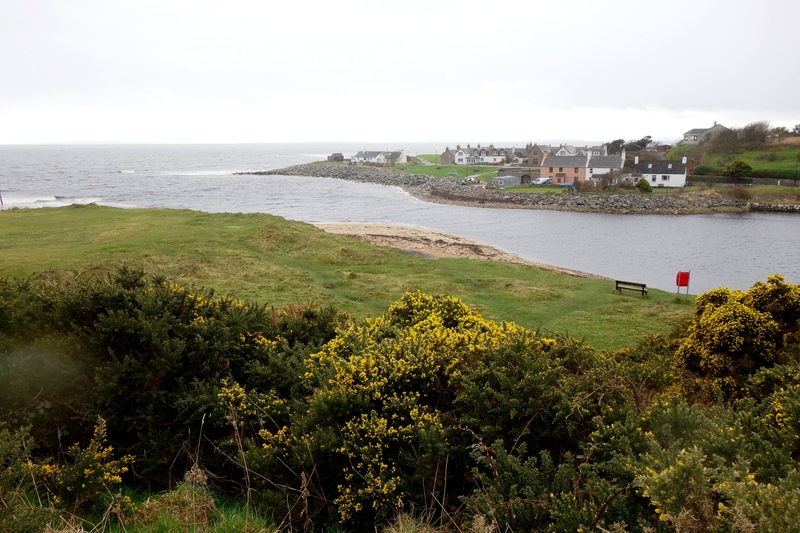 Pat Nicol, a fishing friend there, reported that they had an 18 pounder on the 3/19, and the similarly sized and nearby Helmsdale had two of 20 pounds or better during the first weeks of March. 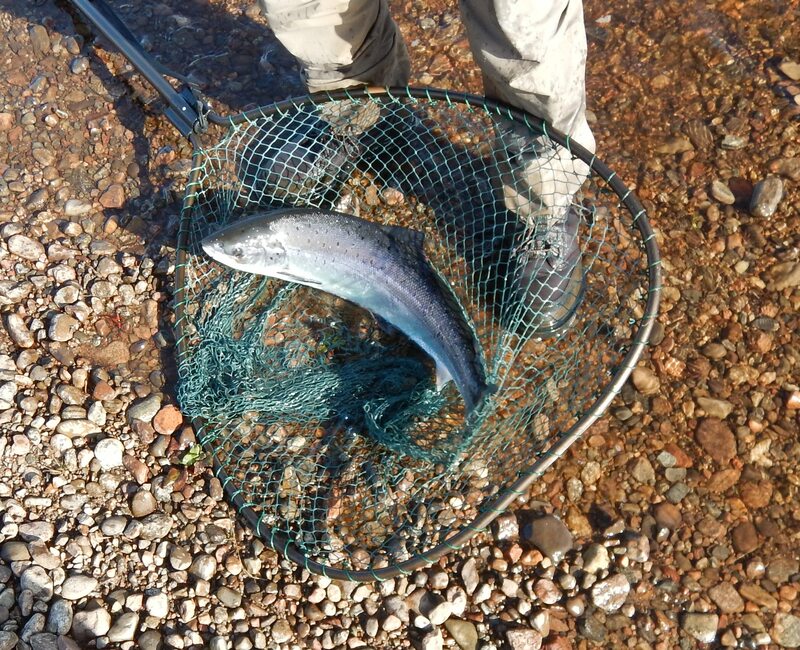 The queen of Scotland’s larger springer rivers, the Dee, had reported 116 landed by the 16th. I think that the general perception is that things are off to a moderately good start. My experience has been that the success in early Scotland salmon fishing is at least something of an indicator of what our Canadian season will be like. After all, to a very large degree we share the same ocean! 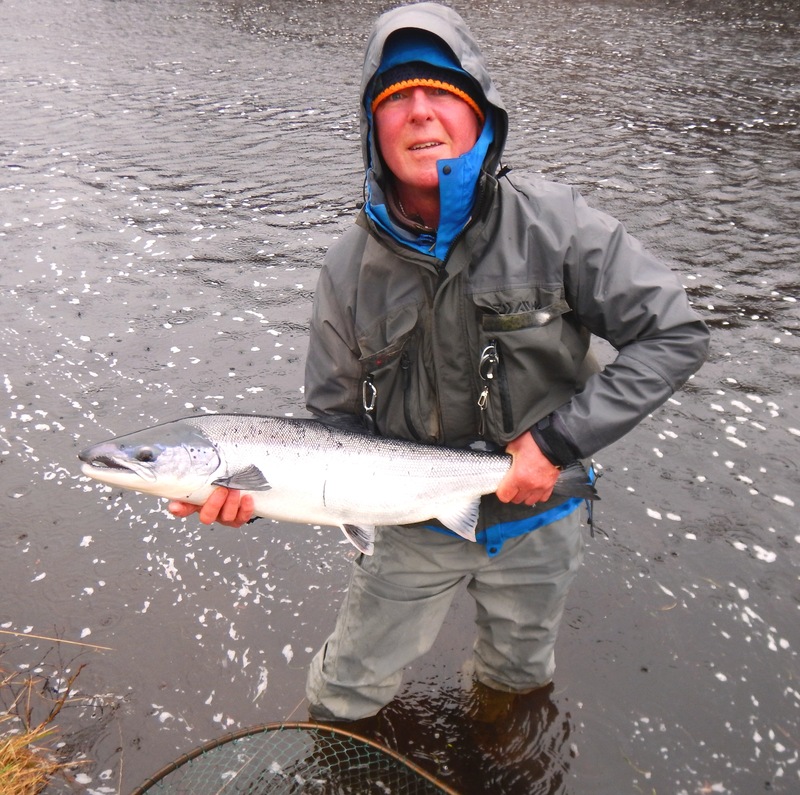 Ghillie Peter Macgregor with author’s best springer of the trip – 15 pounds. 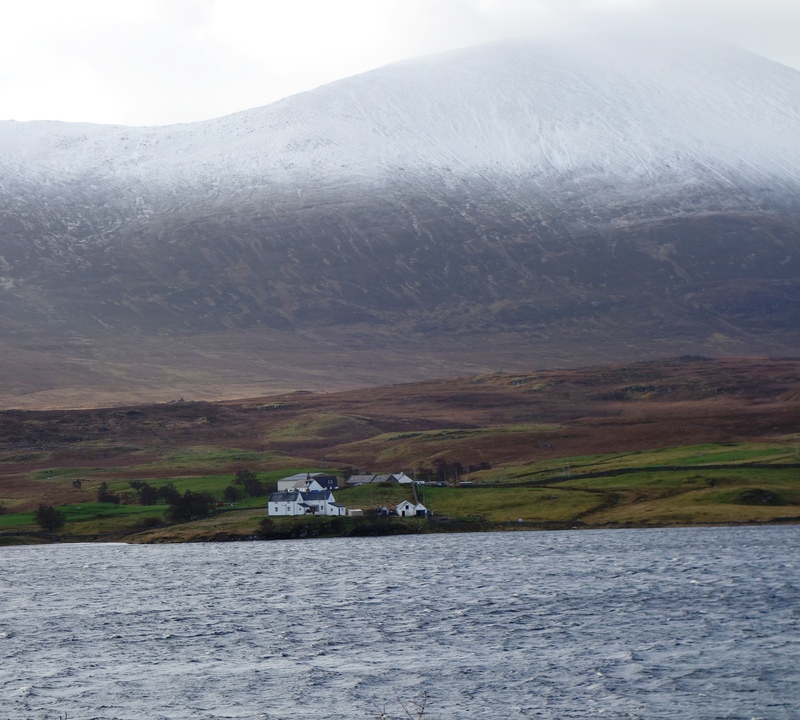 Snow-capped Ben Klibreck looks down on an estate by the shore of Loch Naver. 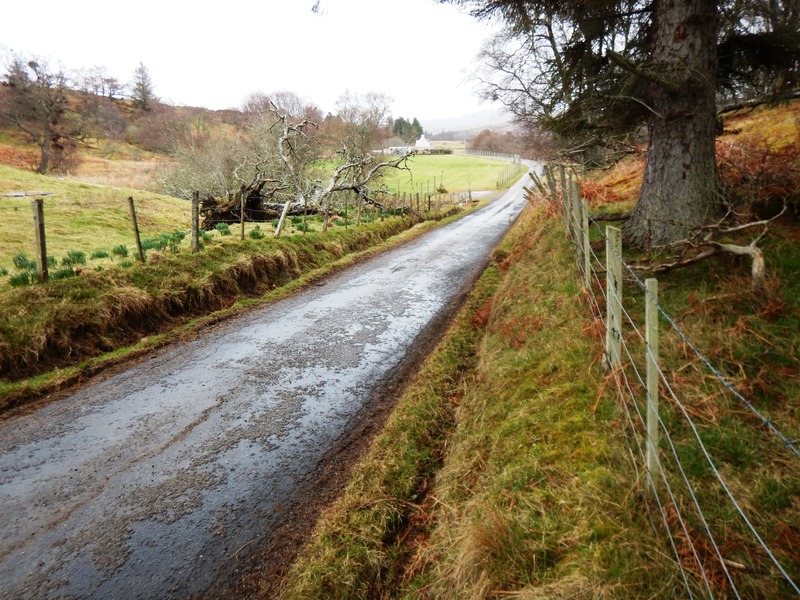 The bleak beauty of Scotland. I’ve now logged 13 consecutive seasons of fishing northern Scotland in March, and while it has become a familiar place to me, fishing amidst the bleak beauty and frightful northern weather of the place is always a fresh experience. This year I put two in the net – this is 100% catch and release fishing – during each of my two weeks on the river. That is pretty much my average, and the best I’ve ever done was 6 for the two weeks in 2017. This year, I think, would have gone better – the fish were around – but we faced unusually cold water most of the first week, and then constant rain the second. This caused the river to rise constantly and left it nearly unfishably high by Friday. It wasn’t all rain, though, the precipitation alternated with hail, sleet, and snow squalls. All came on high winds, and in fact we had two days with wind gusts of over 60 mph. The raw days along the river were mitigated by the company of my fishing mates aka Colin Somerville’s Edinburgh Brigade back at the Hotel Altnaharra. The food and craic are always great, and we thawed out with drams by the hotel’s fire. 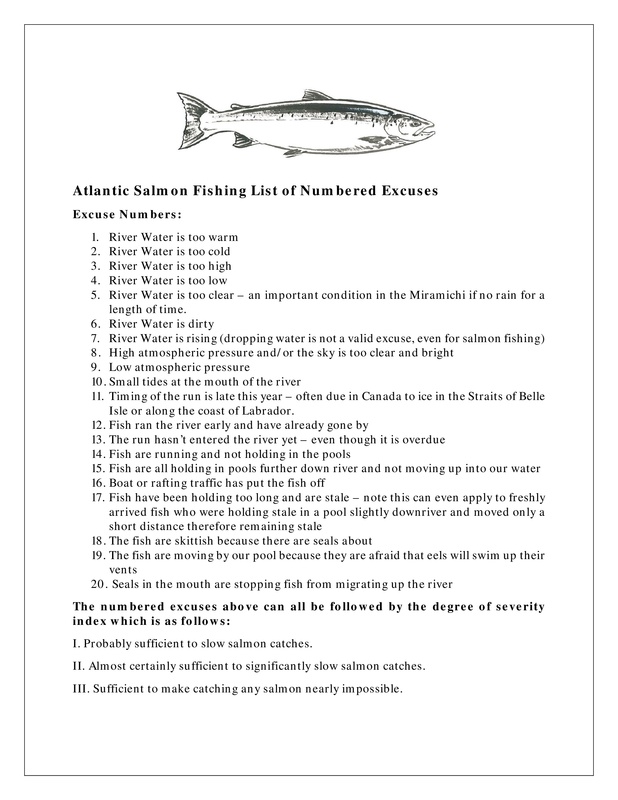 Atlantic Salmon Fishing List of Numbered Excuses – Because of the long list of complaints about conditions that one frequently hears from salmon fishermen I authored this Numbered List of Atlantic Salmon Fishing Excuses that is complete with a three stage degree of severity index. There is no copyright – LOL – so have fun with it if you want (click on image to read better). Blackville, NB – Darrell Warren and Jason Curtis have been sending me weather and river updates from Blackville, and so far we are just talking about some shrinking of the snow pack. Things will be changing fairly fast now though. We had the first red wing blackbirds on the lawn a couple of days ago, deer are out of the woods and eating the new grass even during the daytime now, the Carolina wren I wrote about in January made it through the winter, and I can hear the turkeys gobbling before daylight. It won’t be that long before ice out and the start of spring salmon fishing in NB. 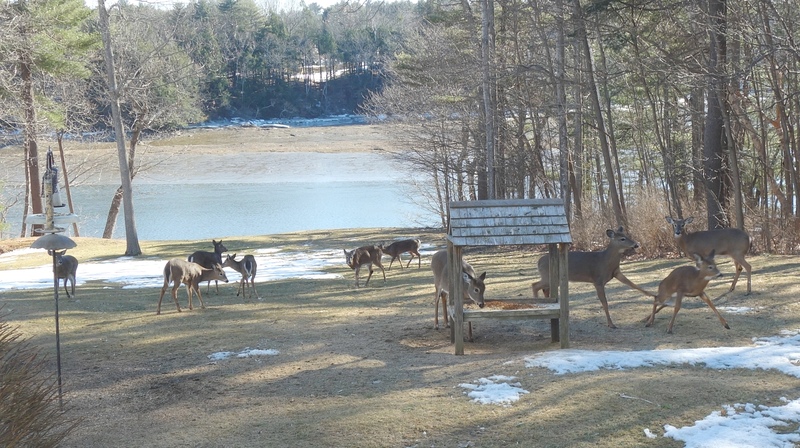 Hungry deer enjoying the partially bare ground in Maine. On the Cains – I got a request from the editor at Stackpole of my new book On the Cains: Atlantic Salmon and Sea-Run Brook Trout On the Miramichi’s Greatest Tributary yesterday, and he requested tying recipes for the long list of Cains River salmon and trout flies that will appear in the book, and beefier captions around the 300 or so photos and illustrations – not to mention the photos of every fly – that will appear in the book. No complaints, but this is going to end up being a big book with a ton of content on the Cains River. The target date for me to have some copies to sell directly is around Thanksgiving. Salmon fishing is not allowed on Sundays in Scotland, so I always play tourist on that day and take a drive through the countryside. 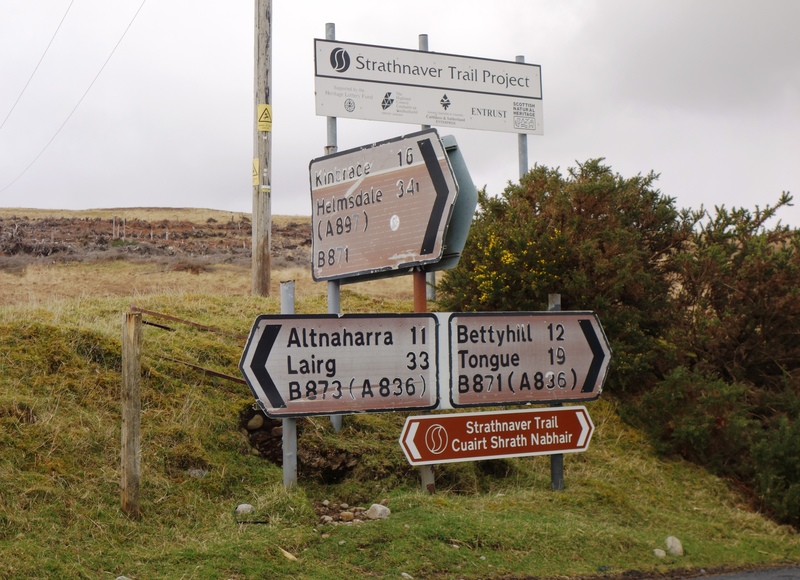 On this trip I explored Strath Brora, home to famous, late, fly tier Megan Boyd and came home via the Helmsdale Road. 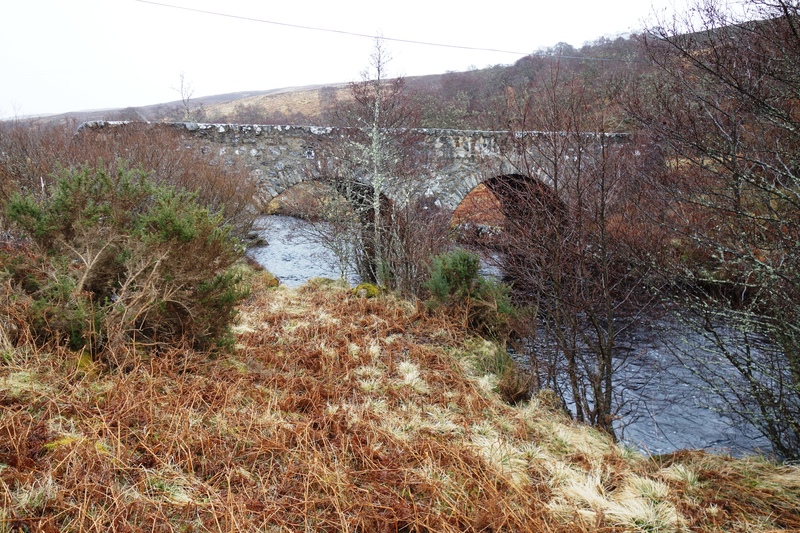 I was told by one Scott fisherman from the area that the upper Brora River was kept very quiet. It certainly was lovely. Gates to Balnacoil Estate upper Brora River. 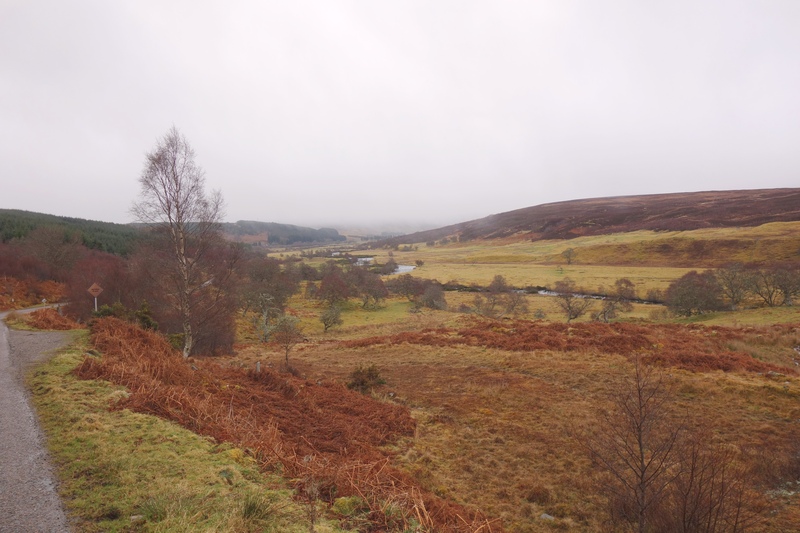 View from the road down Strath Brora. 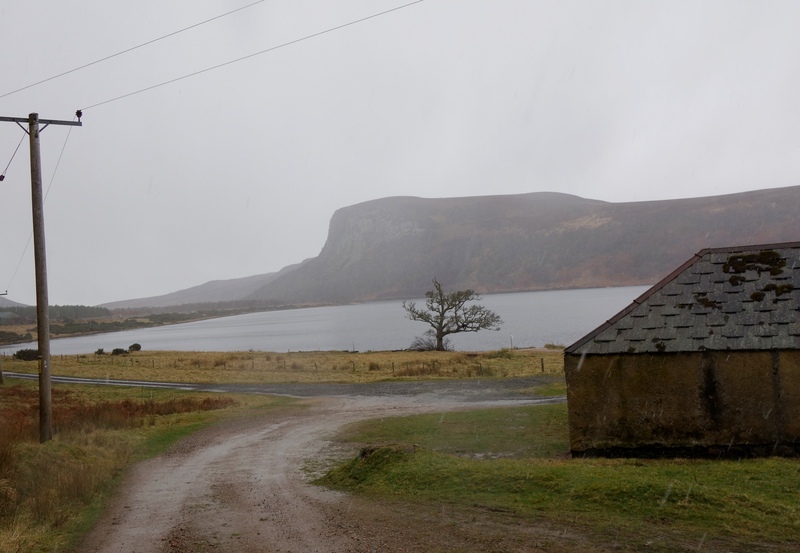 Across Loch Brora to Carroll Rock. The Brora meets the North Sea on the east coast of Scotland. Here are a few more photos from Scotland that I hope you’ll enjoy. Stags in lower Helmsdale yard. A 10 pound springer released at the Wall Pool. Fantastic, Brad. Love all of that. The bittersweet emotions that I could have been up there actually improve it and the photos just bring pride in my ‘native’ Scotland. Congrats on your fish – so well deserved through tenacity and faith. 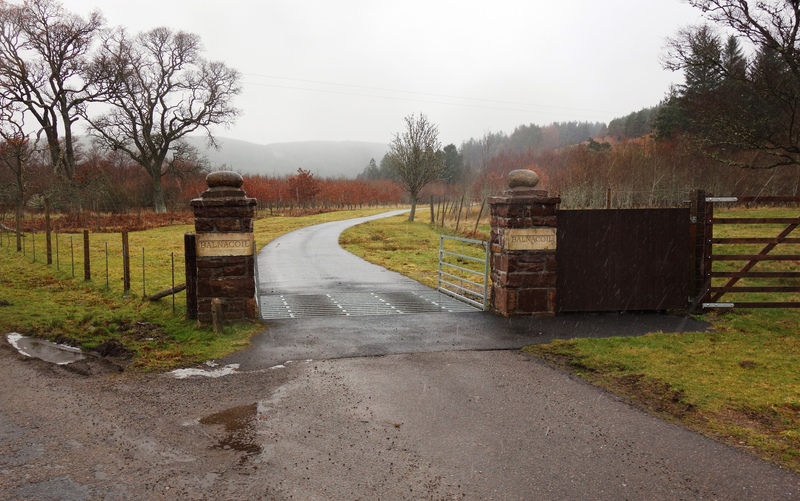 Finally just love the stone gate posts shot of the Brora estate and any post that mentions the late great Megan Boyd is memorable. So my first fishing now is the Nith in late April. Thanks Henry. Scotland’s early March weather can be pretty rough, and I thought this year was particularly so. I love it anyway. Great to hear from you,I love to look at your pictures of Scotland.I particularly enjoyed the video of the underwater release of the bright springer. Spring is here in the Pacific Northwest. we have had 3 days of +70degree weather, this morning we had our first tree swallows arriving. Everyone loves the underwater videos including me. I am going to try some different things this summer – providing I can catch a few to photograph. That water was about 39F, and the wind was blowing about 35 mph or more. I felt lucky to get that shot as clear as I did. The weather is nothing like that here in Maine, but it is supposed to really start warming up for this weekend. We are starting to get a lot of bare ground, though, and the fields in front of my house hosted several flocks of migrating robins today. It was great to see them again. It’s always enjoyable to read your writings on these fishing adventures. We’re all looking forward to your book on the Cains. I’m sure it will be as chock full of interesting content as your wonderful book on the Miramichi. Thanks for sharing this report. I echo the words of Mr. Fred Jennings, “It’s always enjoyable to read your writings on these fishing adventures”. Another superb read and some wonderful photographs too. I can imagine you are already thinking and planning next years trip already!! Looking forward to the new book also. Very kind words from both you and Fred. You that live in the Northern Highlands are very fortunate. We could use some of those single lane roads around here rather than all the crazy expansion stuff we are doing. Loved your Scotland report and photo essay. Am going 5/17. Hope you left some fish for me. Thanks Roger, for most Scottish springer rivers May is the height of it. I’m sure you’ll find a few. Love your countryside, it just looks so pretty. I would love to come to Scotland one day and try catch some Salmon. Here in Australia we can only get farmed Atlantic Salmon, it is very nice but I would love to catch a wild one. A great post indeed; the pictures of the fish and scenery were very enjoyable. Given the weather I’m sure you had the opportunity to sample some of the local Highland Spirits; a report would make an interesting post on it’s own! You’re making your new book sound better and better; looking forward to it’s printing. Thanks for taking us along on your trip.